Two-weight world champion Carl Frampton has warned opponent Luke Jackson he’s in ruthless mood ahead of Saturday’s clash at Windsor Park. Early in the build-up to the fight, Jackson claimed ‘The Jackal’ was looking “heavy” and “sluggish”; comments that have left the Belfast hero eager to punish his unbeaten Australian guest. Frampton said: “[Trainer] Jamie Moore has seen a lot of spite in sparring. There’s been a certain amount of spitefulness in the gym too – more so than before. “What Jackson said annoyed me a little bit. I think he’s been a bit disrespectful. It’s a fight and the media make it bigger than what it is. It doesn’t matter to me though. “If he was my best mate and I had the chance to take him out, I’m going to do it. It doesn’t matter what he’s said – he hasn’t said much to irk me. It won’t affect my performance. “We’ll have a handshake after the fight and go our separate ways I suppose. Only a few hundred tickets remain for tonight’s historic stadium show at Windsor Park – which also features Fury v Pianeta, Cristofer Rosales v Paddy Barnes and more. One of the best top-to-bottom pro boxing cards of the year will air Saturday afternoon, August 18, in Canada exclusively on Super Channel, live from Windsor Park in Belfast, Northern Ireland, United Kingdom. Three-time, two-division world champion Carl “The Jackal” Frampton takes on Luke “Action” Jackson in the 12-round main event for the Interim World Boxing Organization (WBO) Featherweight World Championship in the 12-round main event. Three-time Irish Olympian Paddy “The Leprechaun” Barnes challenges World Boxing Council (WBC) flyweight world champion Cristofer “El Latigo” Rosales in the 12-round co-featured event. In a Special Heavyweight Attraction, undefeated former unified world heavyweight champion Tyson “Gypsy King” Fury continues his comeback in a 10-round match against veteran Francisco Pianeta. Frampton vs. Jackson, presented by Frank Warren’s Queensbury Promotions, will air across Canada exclusively on Super Channel, starting at 2:45 p.m. ET / 11:45 a.m. PT. Frampton (25-1, 14 KOs), fighting at home in Belfast, is a former World Boxing Association (WBA) featherweight and super bantamweight champion, as well as International (IBF) super bantamweight world title holder, who is 5-1 in world title fights, 7-1 versus present or former world champions. Frampton has defeated world champions Steve Molitor – a native Canadian – Kiko Martinez (twice), Hugo Fidel Cazares, Scott Quigg, Leo Santa Cruz and Nonito Donaire. “If he performs to his best and I perform to my best,” Frampton said of Jackson, “I’m knocking him out, simple as that. I’m due a knockout. I haven’t knocked anyone out in quite a while. He sees that he’s a complete underdog and there’s no pressure on him. People are writing him off. That can help fighters. When they have no expectations on their shoulders, they can go and perform out of their skin. “I’m certainly not taking Luke Jackson for granted in the slightest. I’ve done that before against Alejandro Gonzalez and I ended up on my backside twice in the first round. I’ve learned from that fight. I’m the better fighter and I feel fit and sharp. I believe I’m one of the best supported fighters on the planet and that’s down to the passionate Northern Ireland sports fans. The reigning WBO Oriental featherweight champion, Jackson (16-0, 7 KOs) represented his native Australia in the 2012 Olympics. The upset-minded Jackson believes Frampton is finished. “Across the board,” the outspoken Australian spoke about Frampton, “but I don’t think he is as good as he once was. In the first fight against Leo Santa Cruz he boxed out of his skin and deserved to win, but he hasn’t looked the same since. Carl is a very good fighter who does everything good, but I don’t think he does anything great. I respect him as a fighter, I respect him as a man, but I am coming to beat him, not coming over to be friends. Rosales (27-3, 18 KOs), fighting out of Nicaragua, will be making the first world title defense of the title he captured last April in Japan, when he stopped Daigo Higa in the ninth round. Rosales is the cousin of Roman Gonzalez, the former pound-4-pound king of boxing. The reigning WBO Intercontinental flyweight champion, Barnes (5-0, 1 KO) will also be fighting at home in Belfast in front of his passionate fan base. One of the greatest Irish amateur boxers of all time, Barnes will be fighting for a world title in only his sixth professional fight. He won two bronze medals (2008 & 2012) in his three trips to the Olympics, as well as gold in the 2019 European Championships. Two other exciting fights on the “Frampton vs. Jackson” card, in addition to the previously mentioned main event and co-feature, will air in Canada exclusively on Super Channel. Fury (26-0, 16 KOs) had been sidelined with mental health issues for the past 2 ½ years, after shocking the boxing world November 28, 2015, when he defeated future Hall of Famer Wladimir Klitschko (64-3, 53 KOs) by way of a 10-round unanimous decision (116-111, 115-112, 115-112). The 6′ 9″ Fury became the undisputed world heavyweight champion, securing the IBF, WBA, WBO, IBO and The Ring championships, only to be stripped and/or relinquish his title belts without a single defense. Fury returned to the ring this past June against Sefer Seferi, who was unable to continue after four rounds. Pianeta (35-4-1, 25 KOs), a native of Italy who lives in Germany, is a two-time world title challenger. The former WBO European champion is a cancer survivor. 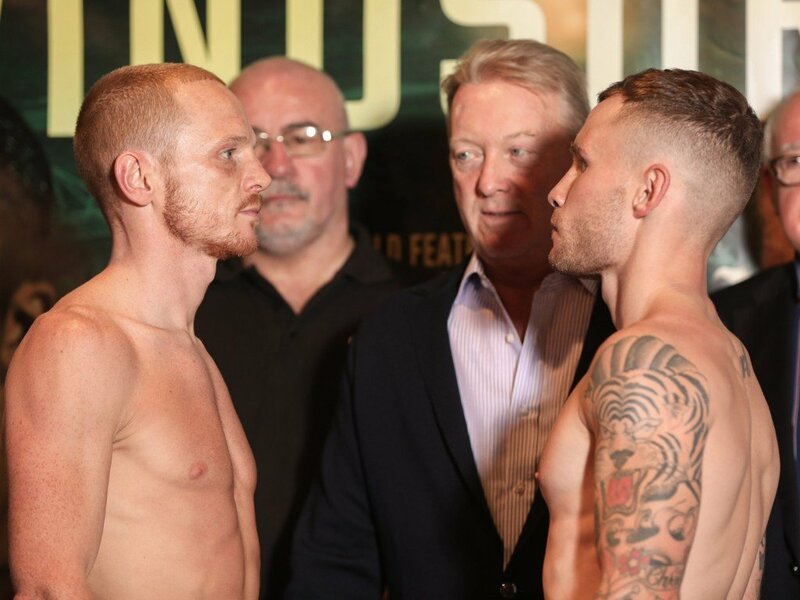 Irish light heavyweight Steve Collins, Jr. (12-1-1, 4 KOs), the son of former two-division world champion Steve Collins, Sr., faces Steve “The Quiet Man” Ward (7-0, 3 KOs), of Belfast, in a regional title fight to open the broadcast. To watch Frampton vs. Jackson live, as well as more exciting boxing to come in 2018, fight fans in Canada can contact their local cable provider to subscribe to Super Channel and all that it offers, including premium series, movies and much more, for as low as $9.95 per month.